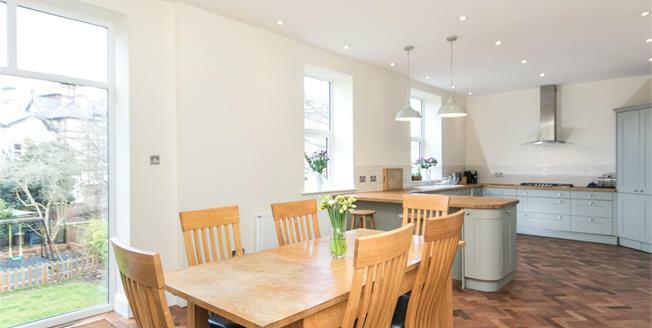 Available with no onward chain delay, this substantial five double bedroom Victorian semi-detached property has undergone extensive renovation and provides any potential buyer with everything needed to suit modern family living. In brief, the spacious accommodation comprises, entrance hallway complete with original tiled flooring, two large reception rooms, cloakroom/wc and stunning kitchen/diner overlooking the large rear garden. To the first floor, there is generously sized master bedroom with en-suite shower room, four further double bedrooms and a four piece family bathroom. In addition, this beautiful property boasts a lower ground level with has plenty of further potential, full uPVC double glazing and gas central heating throughout and a large driveway providing off-road parking for at least four cars. Early viewing is highly advised to fully appreciate what this striking property has to offer. staircase down from the ground floor housing boiler and plumbing for utility room, brand new water immersion heater, access to the garden. The basement is UPVC double glazed and gives access to the rear garden.